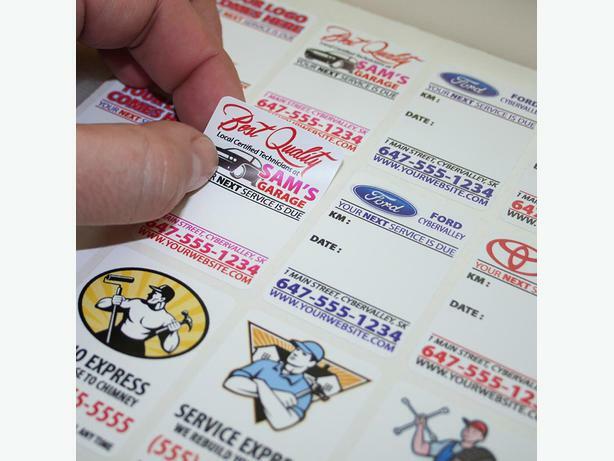 The Lowest prices on the market on Custom Full Color service sticker labels, no setup, design or additional color charge, $10 Flat Rate shipping to the US or to Canada. 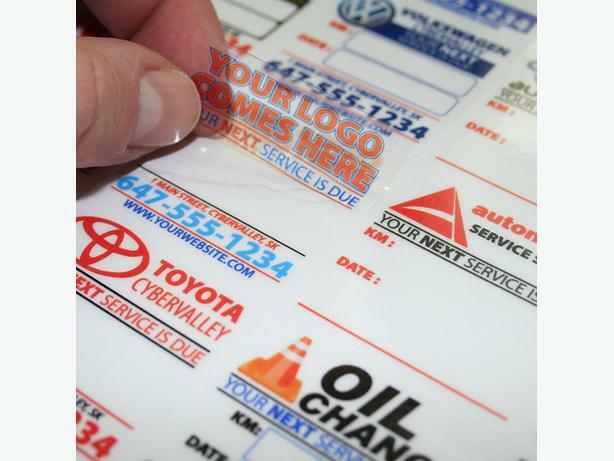 We have a wide range of materials, but in this listing we offer the five most popular automotive service sticker materials only as Clear and White Static Cling, Matte White Low Tack Vinyl, Frosted Clear or Clear Low Tack Vinyl and Clear Low Tack ( sometimes called LOTAC ) Vinyl. 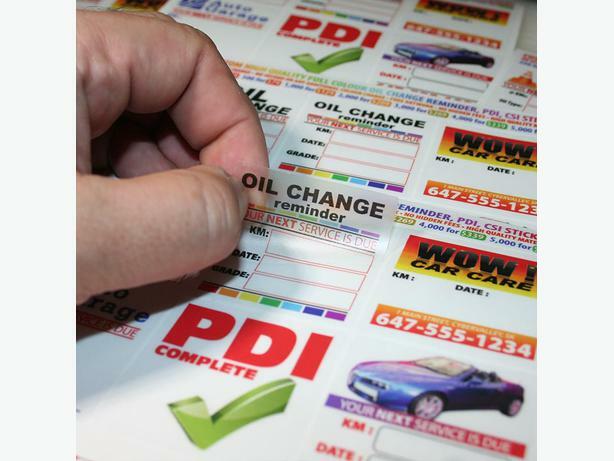 Our stickers are printed using CMYK Solvent inks on high quality - made in the US - materials, they are water and oil resistant, they won't fade out easily and they last for long. 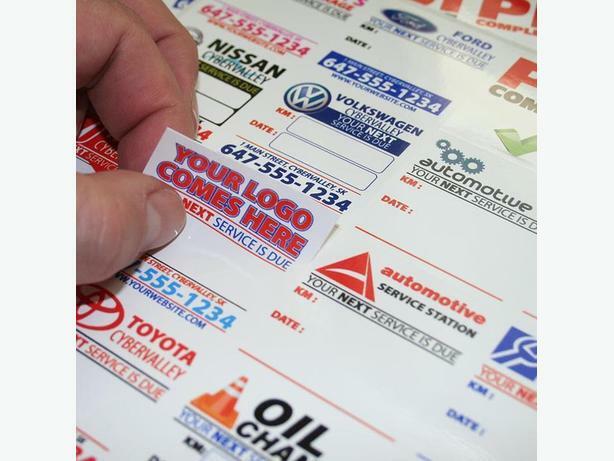 After placing your order, you need to email us all the required information that you want to see on your stickers including the colors, your logo, phone number, web address etc., and we will email or fax you the proof of your stickers that you need to approve before the production. We offer up to 5 free revisions on designs. If you have a print ready artwork to use, you can also email that to us. 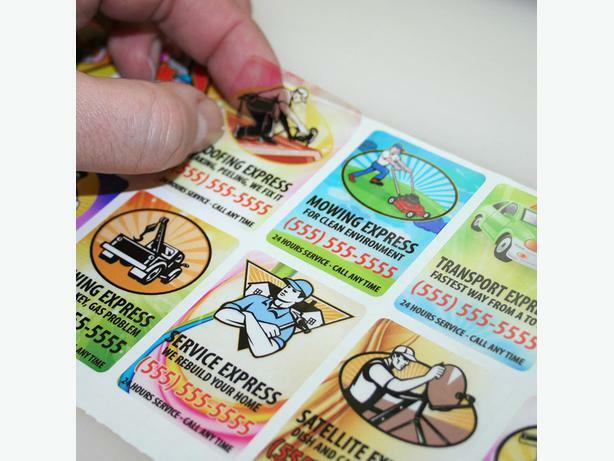 We will make your stickers and ship them from Toronto by CanadaPost within 1-3 business days. Large quantities ( over 5000 stickers ) may require a bit longer production time. Stickers are individually die-cut, and they are on small ( around 10" x 14" ) sheets.